I remember a very confusing time when I found myself gazing at the Strength Tarot card during my meditations. 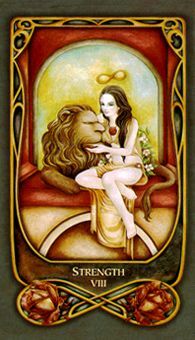 In my deck, a woman holds a winged lion on her lap with a horse in the background. Her gaze is so strong and directed out toward the viewer. I felt she was looking straight at me and inviting me to find my animal strength and honor my passions. The Strength card isn’t my Personality or Soul card, and it wasn’t the Year card either. But I put it on my altar and meditated with it every day for probably six months. It became an Avatar for me: a symbol of the strength I wanted to cultivate and the role I wanted to play in my own life. That card guided me through a difficult phase—and I realized then the power of the archetypes in the Tarot to serve as catalysts for us to improve our lives or work towards a goal. There’s no one way to choose a Tarot card to focus on, but I suggest just picking the one you are most drawn to. This may be a court card or, more likely, one of the Major Arcana. I’ve had clients work with a King or Queen for months, opening to learning about and embodying the qualities of the specific archetype. Even unlikely Major cards like Death, the Devil, or the Tower can be worked with—almost like working with Kali or other destruction archetypes to bring in change and personal transformation. Take some time to look through your Major Arcana and the court cards. Which ones appeal to you? Don’t think about the meanings as much as focusing on the images. Which cards do you come back to again and again? Which cards repel you? Sometimes we are put off by the energies we most need to cultivate. But if you are new to the Tarot, I’d stick to the cards that feel inspiring to you for now. 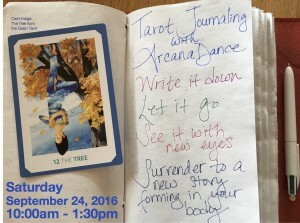 Once you’ve picked a card, spend some time with your Tarot journal writing about the images, colors, and impressions you get from the card. What do you like about it? Once you’ve done this, look up the traditional meanings. Are there any that especially resonate with you? It’s also fun to look at the same card from different decks. You can peruse images online and print out any additional images of your card for your altar or journal. Play with different meditations with your card. You can visualize entering the world of your card, and let a story unfold of what happens. Do the characters in the card speak to you? Perhaps the card serves as a gateway to a whole other scene, one where you can embody the characteristics you most like about the card. Allow yourself to daydream. If you had the qualities that the card possesses, what would you do in your relationships? Your career? Your creative life? How would being like this card make your life better? Journal your impressions from each meditation. Make a list of everything you admire about this card. For example, I had a client, Marcia, who chose the Queen of Wands as her avatar. What she loved about the Queen was her self-possession, her confidence, and her sexual power. She loved the lack of fear and the purpose this queen showed in pursuing her goals. She took these attributes and made affirmations for herself: “I am confident. I pursue my goals with passion and ease.” And so on. When she was in a difficult situation, she imagined how she would act if she were the Queen of Wands. Another client, Luna, chose the Empress as her avatar. Luna was single, in her 60’s, and feeling a lack of love and feminine energy in her life. In her deck, the Empress was surrounded by sumptuous fabrics, flowers, and animals. So, Luna went to a fabric store and let herself purchase different fabrics that spoke to her—faux fur, velvet, silk. She created a special chair covered with these fabrics to meditate in. She also started volunteering at an animal shelter and ended up adopting a mama cat and two kittens. She allowed her maternal, loving nature to flow by loving herself and these other creatures. Both of these women used the inspiration of the Tarot to guide them toward the cultivation of aspects of themselves they felt were lacking. Marcia found herself moving forward in her career with new ease and power. Luna felt her heart soften and blossom as she nurtured herself and her new kitty family. Because she was more open to love in her life, she also met new friends and has started dating again. We never know the power the Tarot may bring to our lives! 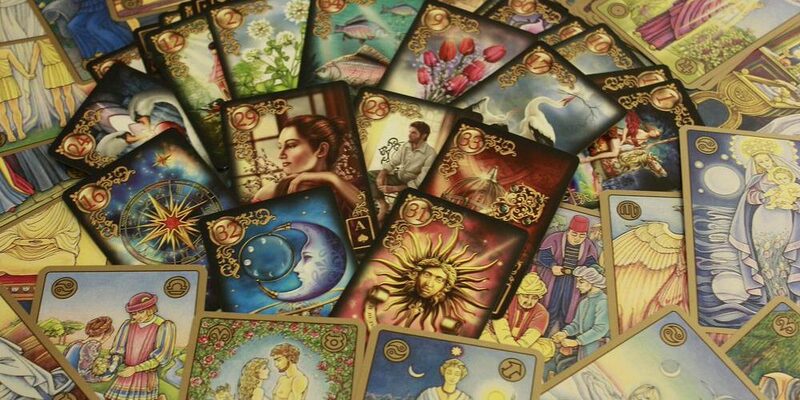 Sometimes it’s helpful to have a Tarot professional do a reading for you in order to help you select your card. Or a psychic can guide you to the area of your life where it would be the most beneficial to do this type of introspective work. I love working with my clients as they embark on their personal Tarot journeys and seeing the profound changes working with a Tarot avatar can produce.